About Birds: The most common nuisance birds in Atlanta are pigeons, and sometimes Starlings and Grackles. The most common issue in bird control is a messy roost of pigeons on or inside a commercial building. The best way to solve a pigeon problem is to install deterrents that prevent the birds from roosting - this includes bird spike and netting, most commonly. If you have a problem with pigeons crapping all over the place, we can keep them away for good. 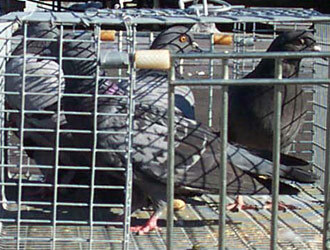 Birds and Pigeons are common nuisance animals in southeast Georgia. In Atlanta and Fulton County, bird have become a particularly common problem, as they have invaded many homes in the area.